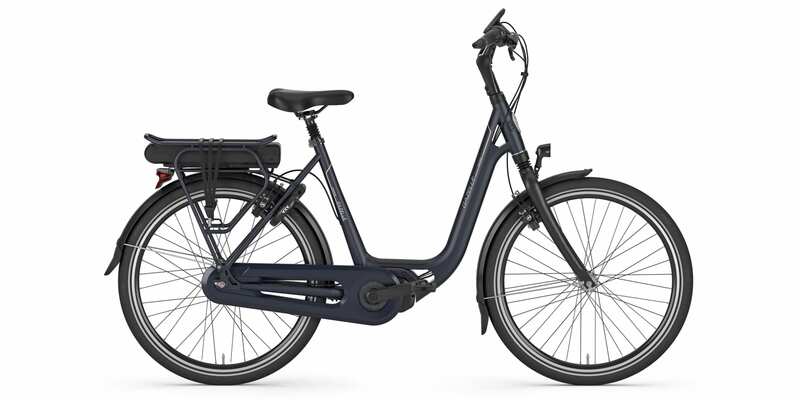 The Gazelle Avenue C8 is a wave style step-thru electric bike with a very low main-tube (combined top tube and downtube). It’s actually still comprised of two metal tubes in order to maximize stiffness and strength, but they are joined with some beautifully smooth welding and gusset plates along the upper and lower portions. 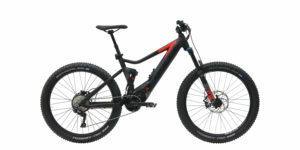 Because the bike uses smaller 26-inch sized wheels vs. 27.5″ or standard 28″ 700c, the entire frame is lower to the ground and that means the absolute saddle height can be lower, even with the stock suspension seat post! Approachability, stability, and comfort are all important in the world of electric bicycles because riders tend to travel at slightly higher average speeds, over longer distances, and possibly get out more frequently. I searched for a definition of the word “avenue” and found the following: a broad road in a town or city, typically having trees at regular intervals along its sides. 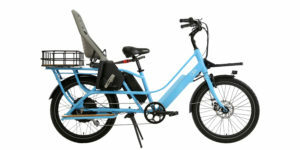 And, I think this really suites this Gazelle ebike because it’s designed for neighborhood and city use. The tires offer a blend of efficiency, comfort, safety, and durability because of their 1.75″ width (slightly wider than average), their reflective sidewall striping, and their puncture protective lining. 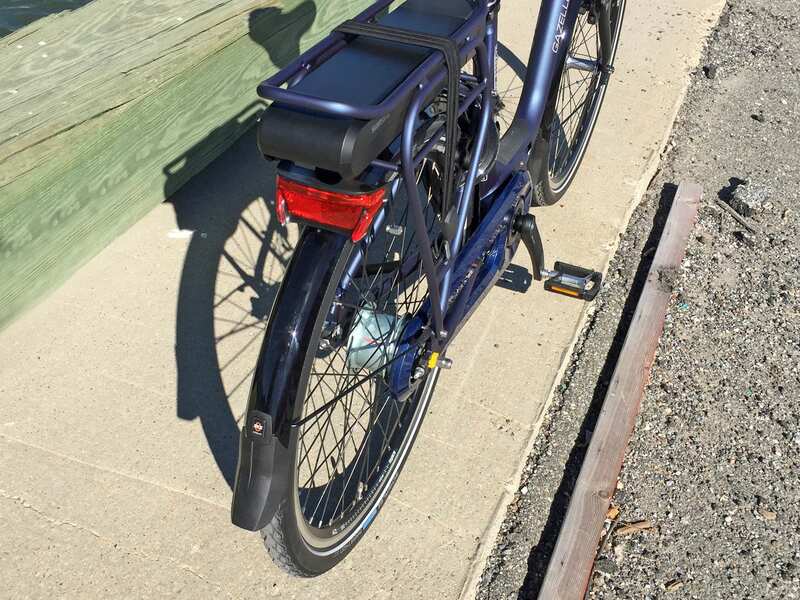 This is a feature-complete electric bicycle with fenders, a fully enclosed chain case, a cargo rack, and LED lights that run off of the main rechargeable battery (the same battery powering the motor and display). I love how the headlight has windows cutouts along the sides to allow for light to shine out and increase your visual footprint, however, the light is mounted on the moving portion of the fork which means it could bounce and vibrate a bit more than if it had been mounted higher on the steering tube or handlebar. 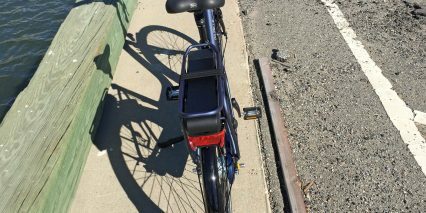 The rear light is positioned above the fender and below the battery, out of the way if you put a trunk bag or side pannier bags onto the frame. The frame color is a unique semi-metallic dark blue matte that matches throughout, even on the chain case, and you can get this bike in three sizes to fit your body and leg length. I noticed that on the smallest frame size (the one I reviewed) the crank arms were extra-short 160 mm vs. the standard 170 mm and that’s the sort of attention to detail that you don’t get with some cheaper products. 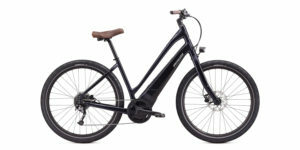 In a lot of ways, $3k is an excellent price for a more premium build with a name-brand motor and high capacity battery. Gazelle has been around for over 100 years and is part of the PON Group in Europe, an automotive company that has really been investing in the ebike space in recent years, acquiring Focus, Kalkhoff, and Faraday. 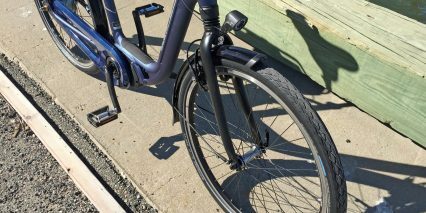 Driving the Avenue C8 is one of the lightest, most efficient electric bike motors I have tested in recent years. 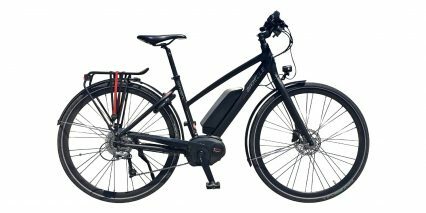 It’s the Shimano STePs E600 mid-drive which delivers 250 watts nominal, up to 500 watts peak, with a maximum torque rating of 50 Newton meters. 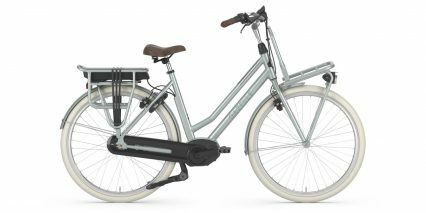 It’s responsive, smooth, and so compact that it hides behind the chain casing and blends nicely with the downtube design. This motor is also fairly quiet, especially in the lower two assist levels. 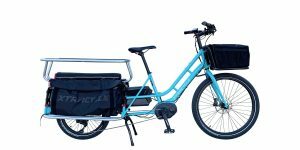 I could imagine that with some panniers on the rear rack, hiding the battery, people might not even notice that it’s electric. A real highlight for me on this bike is that it uses an 8-speed internally geared hub, also from Shimano, that can be shifted at standstill. When you pair a mid-motor with a decent range of gearing, you can maximize climbing power and efficiency to get incredible range. 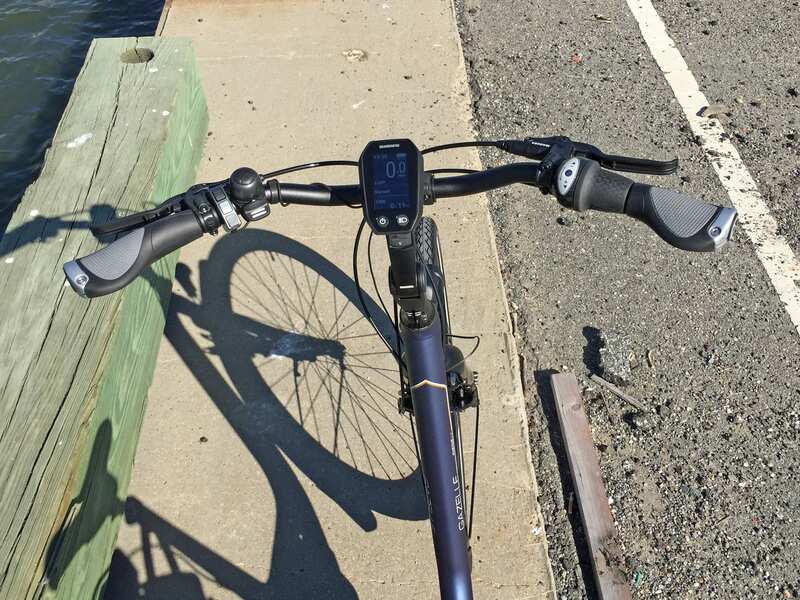 The Shimano display panel has a range estimator readout that was saying 47+ miles for me, even in the highest assist level, and up to 70 miles in the lowest. That’s pretty incredible, but it does depend on how you leverage the gears. 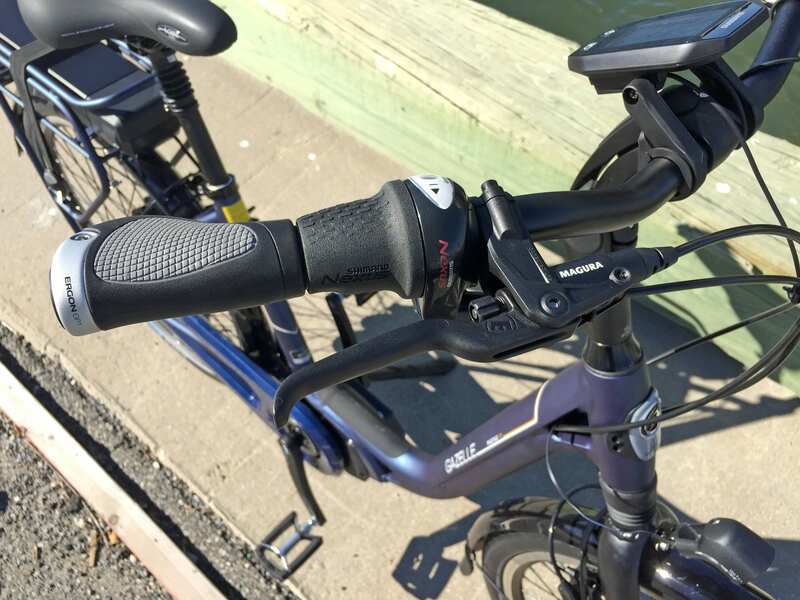 Shifting is intuitive with the half-twist grip shifter on the right portion of the handlebar, there’s even a little window showing which gear you’re in (lower gears are excellent for starting, climbing, and riding slowly). One of the other benefits of internally geared hubs is how clean and durable they tend to be. There’s only one sprocket in the rear and one chainring up front so the chain itself isn’t moving around and probably won’t fall off or rattle, and if the bike tips over onto its side, there’s no derailleur hanging down that could get bent! The downsides however, are that internally geared hubs tend to cost a bit more, weight a bit more, and shift more slowly. 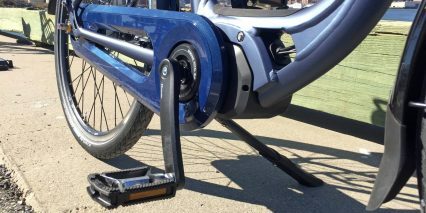 In fact, if you try to shift while pedaling hard, you might hear some clicking and not get a result. The Nexus Inter8 is a mid-level component that tries to protect itself and won’t allow shifting if the forces are too high. 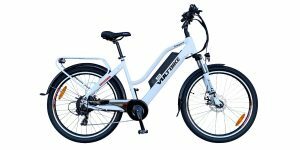 And of course, because this is an electric bike with 20 mph top assisted speeds and the additional weight of that motor and battery, it’s important to have reliable braking power. And that’s exactly what you get here… some very nice Magura HS11 hydraulic rim brakes with big comfortable levers. The lever position can be adjusted to make them easier to reach for people with petite hands and the hydraulic lines, verses mechanical wires, tend to require less hand strength. 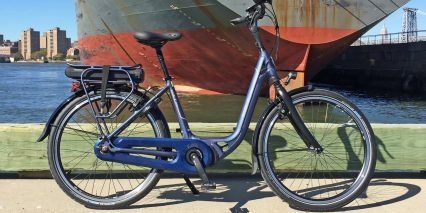 Powering this bike is an upgraded 36 volt 14 Amp hour Lithium-ion battery pack that slides into the rear rack. 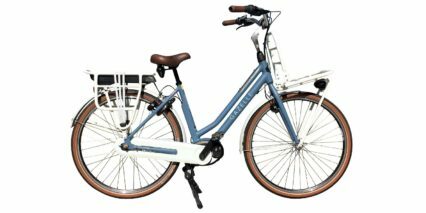 The older Shimano battery offered 36 volt 11 Amp hour capacity, and was still great, but the industry has been moving towards the half Kilowatt-hour size because the affordability of energy dense cells has gone up (meaning you can put the same number of batteries into a box but each battery has more power). Weight hasn’t increased much either, maybe one half of a pound, so this is a big win in my book. 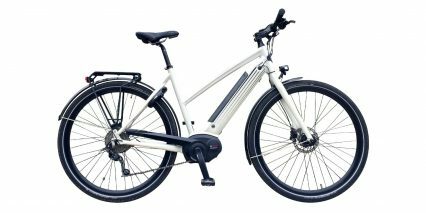 You can charge the battery while mounted to the frame or take it off, perhaps bringing it into your workplace for a top-off during the day. 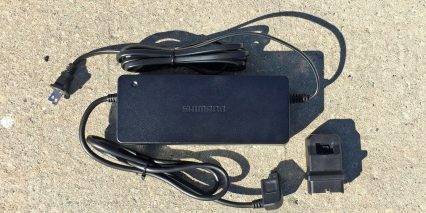 And, I love how quick the Shimano STePs battery charger is, offering 4 Amp out put vs. just 2 Amps on many cheaper products. 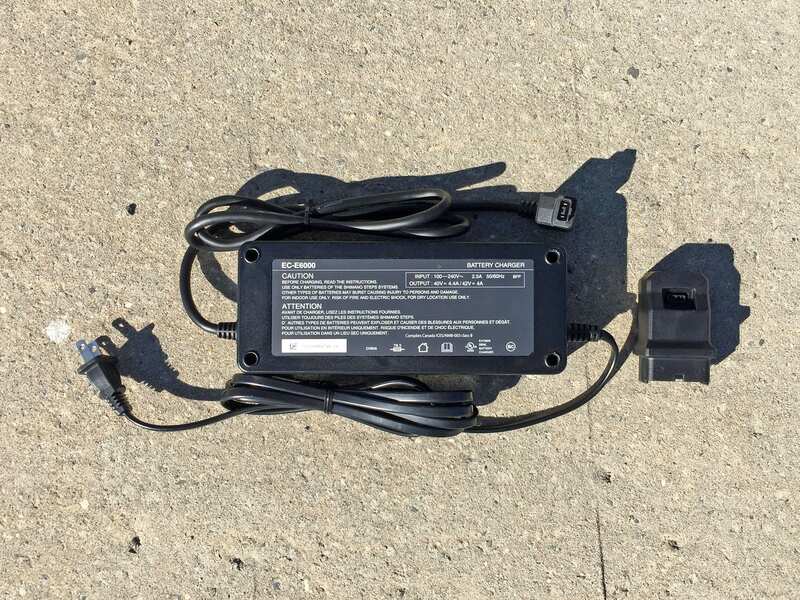 The gripes I do have however, are that the charger is a bit bulky and heavy… and that it requires a little plug adapter to charge the battery directly when off of the frame. This block does not attach securely to the end of the charger plug, nor does it have a leash or other attachment feature. So it would be easy to set down, drop, or just misplace and then lose permanently. 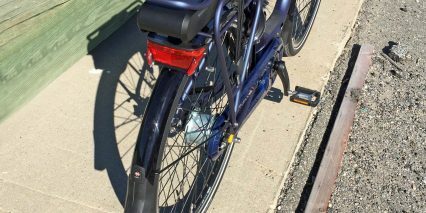 In that case, you would only be able to charge the battery when mounted to the bike frame, and that means you need to bring your bike close to an outlet. For people who live in upstairs apartments or don’t have space in their garage, this would be a bummer. So, keep track of the little charger dongle thing! And Shimano, please improve this design… Bosch and other companies have been able to use the same charging port on their bikes and the battery so you don’t need a dongle at all. 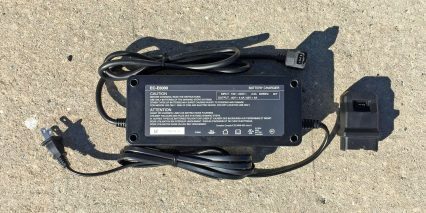 To really maximize the life of this and other Lithium-ion battery packs I have heard that you should store them in a cool, dry location and avoid extreme heat and cold. 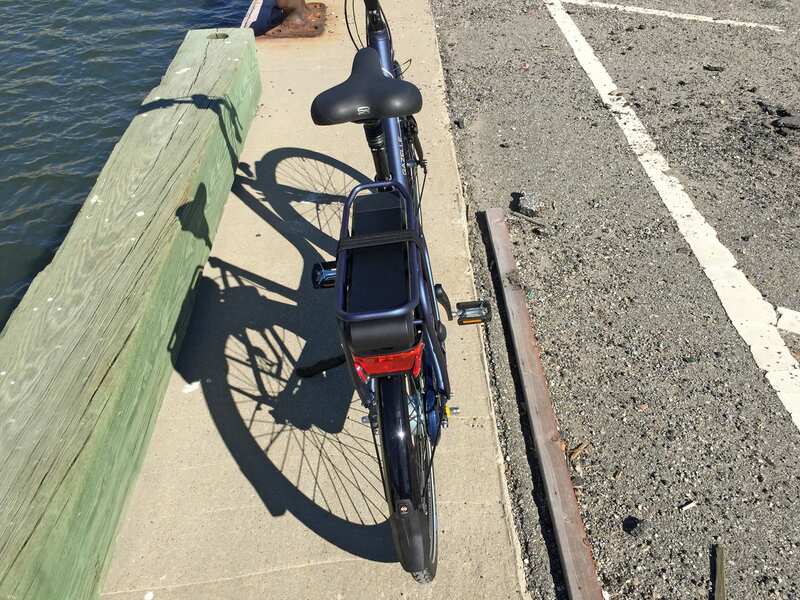 The battery could cost over $800 to replace but is very secure when locked to the frame, and I like that the rear wheel lock uses the same key. I do have a gripe here however too, the key must be left in the frame lock to have it in the open position. 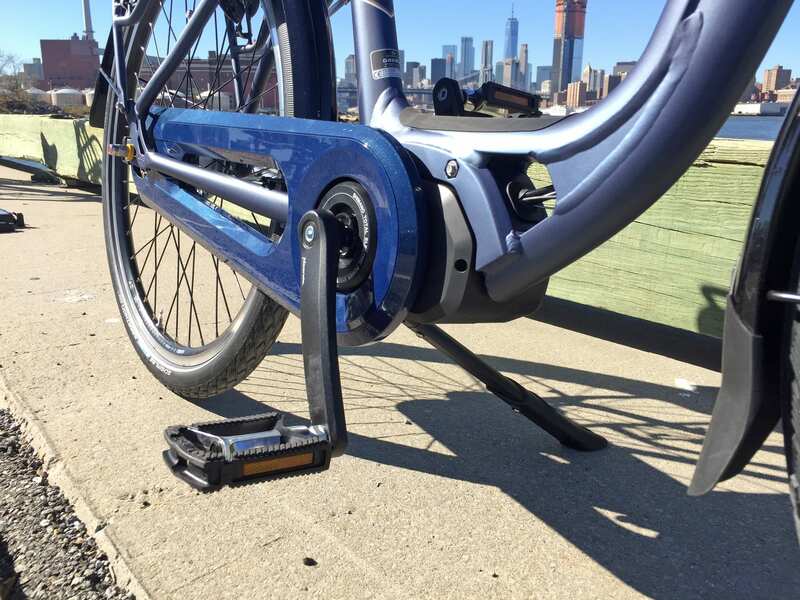 If you have a keychain connected to the ebike key there, it could jingle around and even scratch up the frame or get snagged on your pant leg or dress. Other frame locks I have seen allow you to remove the key in the open or locked position, so this was a bit quirky and frustrating to me. I suppose you could lock the frame every time you stop and take the battery off, but with the key not on a keychain, what if you misplace the key! It’s like the charger adapter plug situation all over again, two small and important parts that could just be floating around if you don’t keep your wits about you. 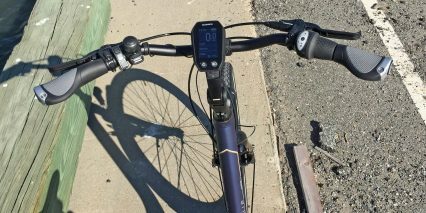 Operating Shimano STePs powered electric bikes that use the new E6010 display panel is easier than ever! This display is larger than the old model, uses a transflective LCD that is easy to read in direct sunlight, and only requires one on/off press whereas the old display wouldn’t power up until you pressed a button on the battery pack first. Sometimes that meant reaching way back or even getting off the bike and then back on. I love almost everything about this display and the accompanying three-button control pad, which is mounted within reach of the left grip. You can remove the display for safe keeping just like the battery pack, adjust its brightness, and even invert the font color from black text on a white background to white text on a black background. It beeps sometimes when you change assist levels or navigate through menus and that can even be turned off in the settings menu. The basic operation begins when you press the power button on the display and then press either the up or down arrows on the control pad to raise or lower assist power. Getting more advanced, you can press the center button on the control pad to cycle through trip stats like average speed, maximum speed, distance, odometer, and then range. As mentioned before, range is really cool because it can help you plan rides so you don’t run out of power half way. Range is dynamically calculated based on the battery charge level and whatever assist setting you are in (Eco, Normal, or High). There is also a battery infographic at the top right corner of this display which uses a percentage vs. five or ten bars like so many competing ebike systems. If and when you want to get more advanced and change the font color or brightness stuff, just hold the up and down arrows to enter the settings menu. This Gazelle Avenue C8 does so many things right and I recognize and appreciate lots of little things about it that might go unnoticed by someone who doesn’t study bikes all day… The frame design and wheel sizing, the longer front fender to keep your shoes and shins dry, the rubber pad at the base of the main tube to protect the paint, the minimalist suspension fork, tool-free adjustable stem, name-brand locking ergonomic grips, color-matched chain casing, nicer flick bell, and internally routed (but still accessible) cables and wires. Even though they did not included bottle cage bosses on the seat tube or main tube, you can easily add a trunk bag with a bottle holster for under $25 like this. 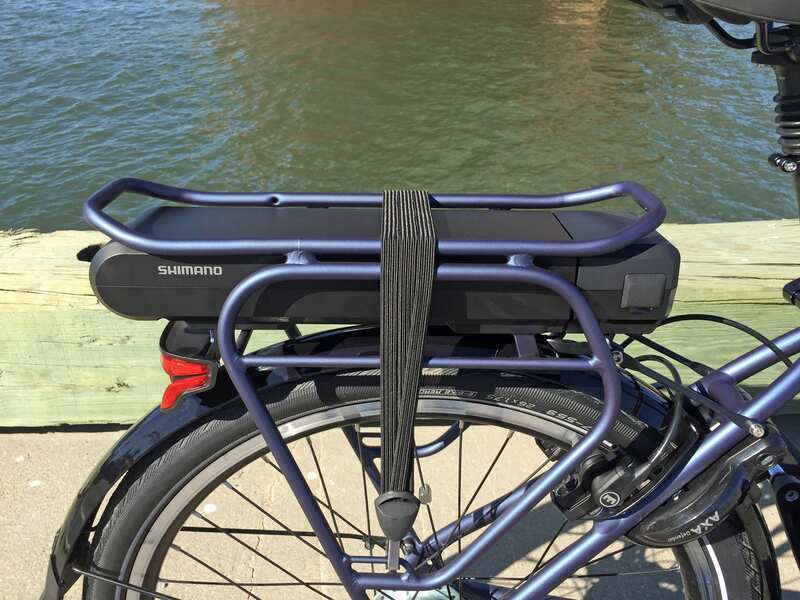 The rear rack uses standard gauge tubing that will be compatible with most clip-on or velcro panniers, and it’s got really nice tubing supports on both sides that will keep bags from rubbing against the tires. 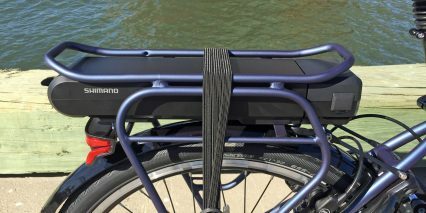 It even comes with a triple-bungee cord for securing lightweight items quickly. 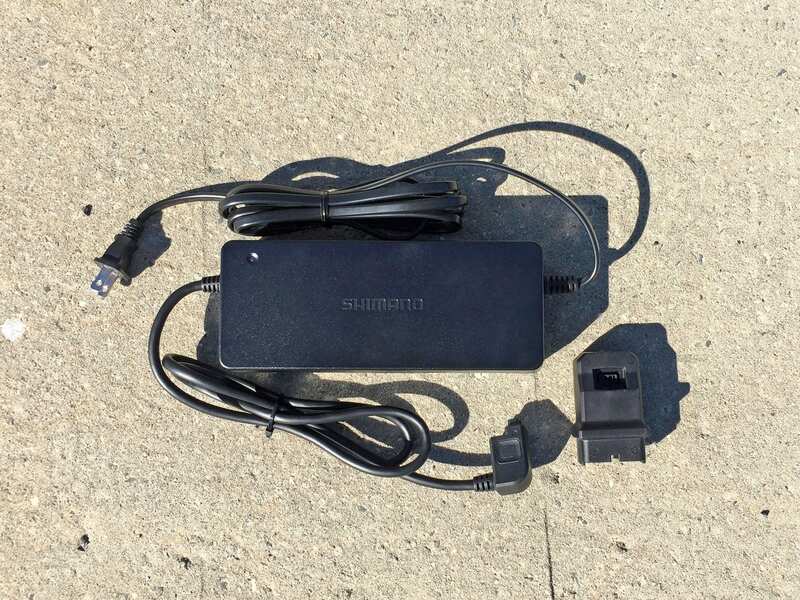 Most of the areas that I feel could be improved rely on third party vendors like Shimano (for the charger weight and dongle adapter) and AXA (for the frame lock key design). Bosch now offers an Active Line motor that produces less torque, less noise, weighs less, and would be a good option to compete with the Shimano E6000, but I still like this motor and prefer the Shimano display (especially compared to the minimalist Bosch Purion seen on the Bulls Cruiser E). 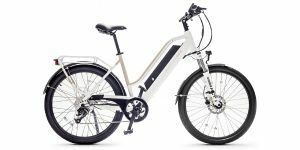 Compared to that ebike, the Avenue C8 is lower to the ground, lighter weight, less expensive, and it has eight speeds vs. just seven. 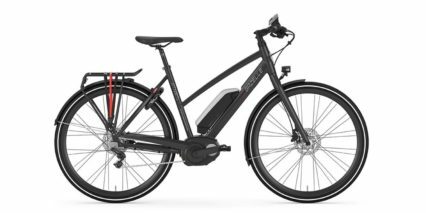 I hope this deep review and video ride test help you to learn more about ebikes and consider the trade-offs between drive systems. 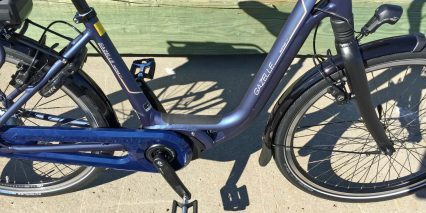 Big thanks to Gazelle for partnering with me on this post and to Chris Nolte at Propel Bikes in Brooklyn for letting me review one of his demo models and proving some insights. As always, the comments are open below and I’ll try to help you with any questions. 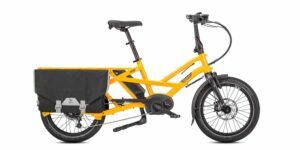 You can also connect with other customers and enthusiasts in the Gazelle Ebike Forums. Once again, we have a mid drive that has no throttle. 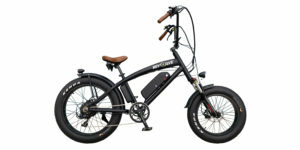 While having no throttle is something that EU regulators shoved down the throats of European ebike riders, and respective OEM’s, the lack of a throttle remains a serious shortcoming of all of these ebikes. Most mid-drives do not have throttles, except for Evelo. 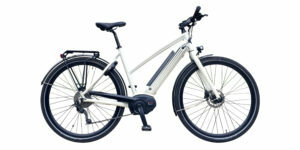 Customers typically demand the throttle, for uses such as having help while navigating from a stop on a hill, to occassionally not wanting to pedal, and other situations that an ebike has an advantage for the user. The US doesn’t have to accept this, and nor should consumers accept these very high prices for mid-drives. They are really hard to maintain or service, and will be much more expensive in the long run. 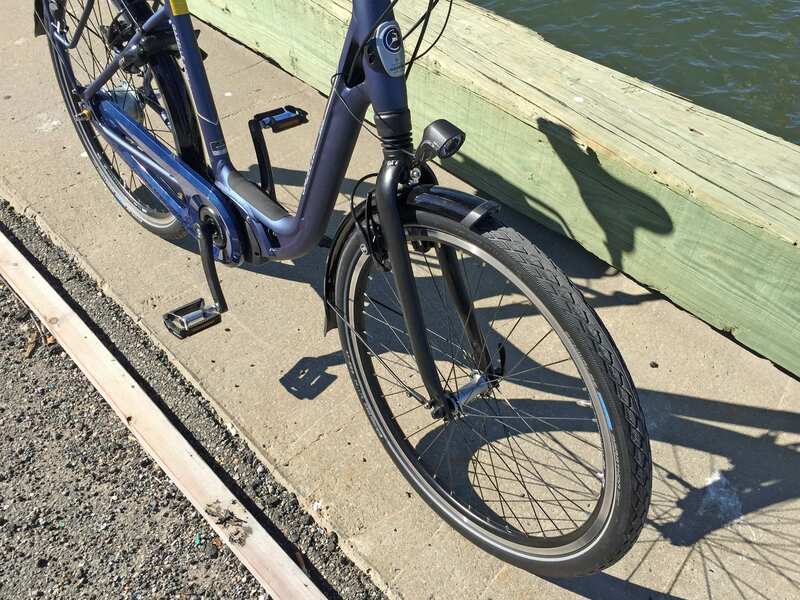 Wheels: 26″ EasyFlow vs 28″ Arroyo. Stand over height: 15.5″ EasyFlow vs 16.5″ Arroyo. Weight: 52.5lb EasyFlow vs 58.7lb Arroyo. Motor torque: 50nm (Steps E6000) EasyFlow vs 63nm (Bosch Performance Line) Arroyo. 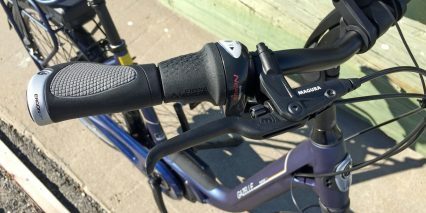 Brakes: Magura HS11 EasyFlow requires a hex tool to adjust the lever reach vs Magura HS22 Arroyo has finger-adjustable knob instead. Front light: B&M Upp-T 30 lux EasyFlow vs B&M IQ-TEC 60 lux Arroyo. 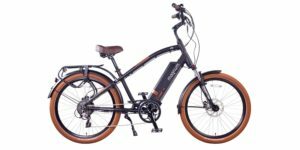 Hi Court, I got to review the EasyFlow after Gazelle kindly let me borrow one for a one month test ride, my review is here. 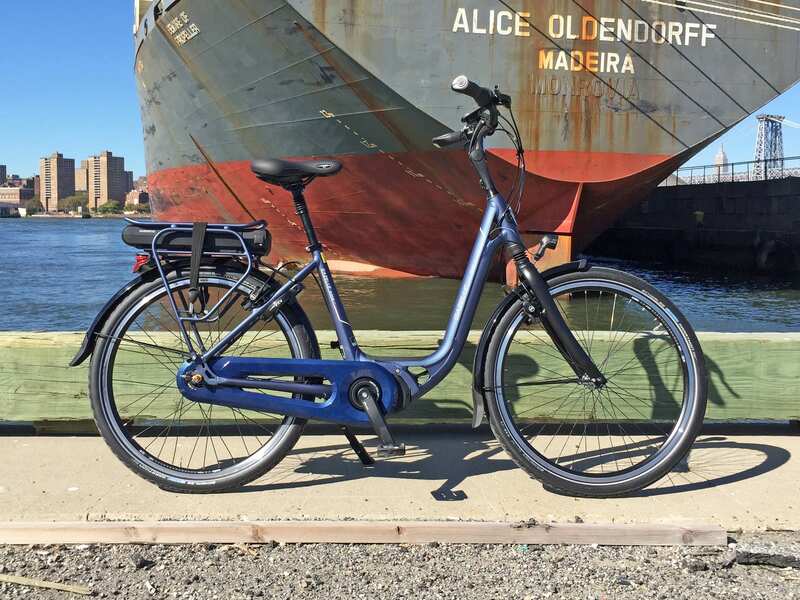 We purchased 2 Gazelle Arroyo (2018 model) bikes in mid-April and were initially pleased with them. Having never owned e-bikes before, it was so great to be able to go all over our hilly area and not feel exhausted at the end of a ride. But almost immediately after getting going on our brand new bikes, we started experiencing full power failures. This occurred more frequently on one bike than the other, but we both experienced it numerous times and with no apparent cause or warning. The power simply cuts out and it takes a few minutes to get it back. We took the bikes in and our dealer (The New Wheel) rewired the computer connections. We rode off and all was fine for a while, but then both bikes started having the same problem. New Wheel brought us loaners and took the bikes back to fully rewire them. The loaners were different bikes, but with the same Bosch motor. For some reason, my wife was able to get this bike up the very steep hill to our home, much easier than she could with the Arroyo. This hill is hard for me as well, even though I’m an experienced cyclist, but I just figured the slope of the hill would be a challenge even for a heavy, pedal-assisted bike. But for my wife, the loaner seemed easier to use on this steep climb. Anyway, our Gazelles were rewired and my wife was told the lowest gear was also somehow adjusted to be even lower than it was, thus supposedly making the climb easier than before. It has only been a day since our bikes have been back with us, so we don’t yet know if the electrical problem has been resolved. But in climbing the hill to our home, my wife actually had to get off and walk the bike up! It was actually harder, not easier, to do the climb. 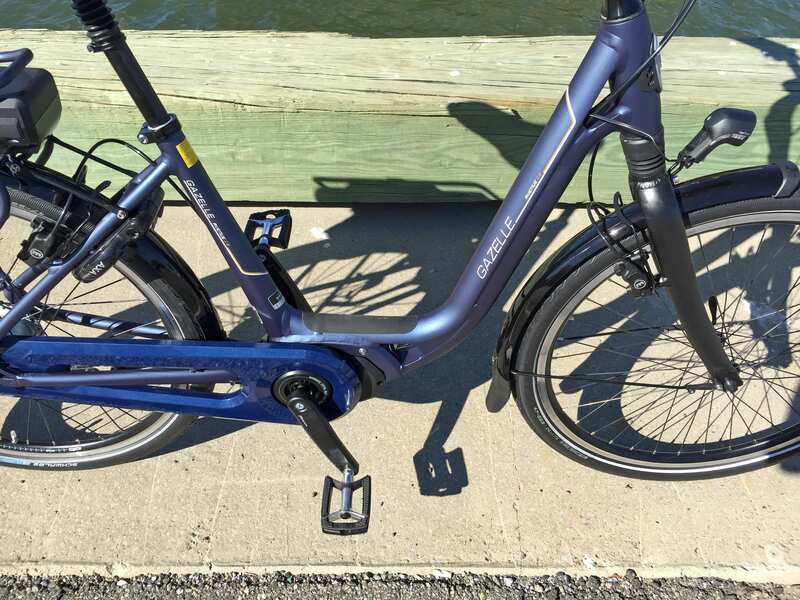 Long story short, we are deeply disappointed in the functionality and reliability of this bike. From our conversations with others, we also now know the electrical issues we’ve experienced are not only known, but they are common with this brand. As for the hill climbing issue, I’m not sure what to say except that it seems the pedal-assist during climbing is not what it is reported to be by Gazelle. My wife is going to ride tomorrow with one of the owners of The New Wheel, so he can see for himself what a struggle our hill now is. Then I’m guessing we will be considering our options for what to do about our purchase of these very expensive, but unreliable, bikes. If I were to do this again, I’d definitely do more research into actual customer reviews as opposed to the many on-line “reviews” by various professional reviewers (e.g. EBR) whose credibility I now fully question. 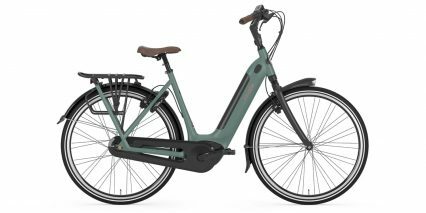 I think the Gazelle Arroyo has the potential to be all it is hyped to be and more, but it’s not there yet and we feel totally taken by all the supposed high praise of Gazelle’s quality control. Do not befooled by the hype.